When holidays or other special days approach, many times it comes up on us lightening fast. You blink, and what was once 3 weeks to get ready is suddenly the next day! Time zooms by and budgets are stretched for many during the holidays or birthdays. You may also have hard to buy for persons on your list, making shopping for a gift painful. 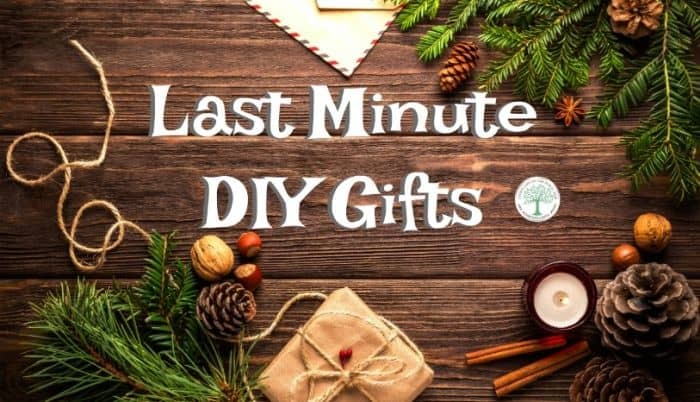 Easy last minute diy gifts for friends will keep the gift about the person, not money spent. You can make these diy gifts in under an hour, making them perfect for last minute giving. For a perfect diy gift for mom, try making a homemade sugar scrub. Great for softening skin and pampering themselves, it’s sure to bring a smile. Double the recipe for a last minute hostess or teacher gift, too. Get the DIY directions here. After skin has been exfoliated with the sugar scrub, replenish moisture and feel relaxed with these lotion bars. 3 ingredients, and less than an hour to make? Win-win! Get the DIY directions here. You can also whip up this wonderful whipped lotion in a hurry for a luxurious gift! Get the DIY directions here. How about creative gift ideas for friends that will help them keep their home smelling great all year long? DIY wax melts are perfect for any wax warmer. Customize them with different oils for any occasion, too. Get the DIY directions here. If they don’t have a wax warmer, you can always whip up these DIY candles in under an hour, too! Floating candles make a GREAT last minute gift for anyone on your list, too. Get the DIY directions for those here. For a last minute diy gift for your boyfriend/husband/father, pamper them with this mountain man beard oil. A great woodsy, musky scent that will soften tougher beard hairs. Add a new comb or brush just for their beard to make this gift complete. Get the DIY directions here. Here’s a few more last-minute ideas if you’re running out if time. If you have a few more weeks to get ready, and you are ambitious, try some of these easy DIY gifts! If you are an experienced knitter, or even a beginner, you know that homemade items are full of love. Keep their feet warm and filled with cozy comfort with homemade socks. Great afternoon project, while you sip warming hot chocolate and nibble some cookies. Get the FREE DIY pattern here. Making homemade soaps are always a win! You can easily add any scents you like to customize your gifts, too. I love how easy these hot process bars are to make, and the video will take you step by step in making your own. Add a few bars with a soft towel, unique hairbrush and you have a perfect gift for back to school, too. Get the DIY directions for that here. How about a last minute gift of food? Cookies are almost always welcome by everyone, and these Traditional Scottish Shortbread are perfect for a cookie gift basket. Try no bake peanut butter oatmeal cookies, with some coffee or hot cocoa and a new mug make a thoughtful, fun gift. Add some chewy brownies to round out that treat gift basket in style! Of course, you can wrap these gifts up eco-friendly style with this DIY gift box. Super easy to make, using recycled materials! This makes a crafty gift ideas for friends, too! What kind of last minute gifts are you needing to make? Will you try some of these? Be sure to pin this for later! The last couple of emails I’ve received asked if I had a question or whatever to go ahead and ask. Well I’m coming to you with a question and what I’d like to know is could you give me the names of some GOOD seed catalogue companies. I’d prefer ones that provide the seeds for the right areas. I’m in Canada, western Canada, and would like to get a company that caters to our seed area so that the plants I grow will be able to tolerate the hot summers and cold winters with the seeds arriving at the right time to plant. I hope that makes sense and isn’t confusing. I thank you for your help as I’m looking for some heritage seeds as well. Thank you again for your help!